We provided activities for our students aged 20 years old or younger including, 2 two-night breaks, 9 day/evening trips, 6 Disco’s & 6 Supper Clubs. The activities took place in different areas of Scotland & England. Experienced staff, who had well developed relationships with students, lead & supported on these trips, to ensure they ran smoothly. The Supper Club ran between Upward Mobility's regular hours & the disco, making the discos more accessible and providing a longer period of respite for carers. The supper club gave students a chance to eat out at restaurants & also prepare meals within Upward Mobility's premises. We had 2 overnight breaks one to Low Port where students got to participate in activities such as, climbing & laser clay pigeon shooting. The second was a ‘Glamping’ trip to Harvest Moon. Students tried activities such as fat biking on the beach, making camp fires & sleeping in Safari tents! This trip really highlighted and worked on developing skills such as team work, independent living and self-confidence. The day & evening trips went to places such as Blair Drummond Safari Park & Dynamic Earth. These trips ran at the weekend, giving students a chance to socialise & meet new people. Our trips ran on a variety of days so carers could have respite when they wanted, this gave carers the opportunity to go on holiday, or have some well-deserved time off at home. The breaks provided respite to carers who were, carers of young people with multiple additional support needs, single parents, carers living in areas of multiple deprivation & black or ethnic carers. 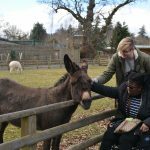 We gave respite to a range of students who have, physical disabilities, long term medical conditions, learning disabilities, mental health conditions, autism/autistic spectrum condition & sensory impairments. The OutMo service was recently assessed by the Care Inspectorate and was awarded a 5 (very good) across all areas assessed. We have made a number of changes to develop this service going forward. This includes having a clearer budgeting model and looking at ways top open the service to a wider pool of students and carers. Project planning and budgeting, we have learnt to project plan better and have improved the ways that we plan and assess our budgets. Targeting families most in need of support, we have improved our targeting of students/families most in need by being more focused and pro-active about encouraging participation. Developing new short breaks activities, we listened to our students and their families and are continuing to develop the types of breaks we offer in response to on-going feedback. The importance of monitoring and evaluating a service continually - we are improving the ways that we monitor and evaluate what we offer. 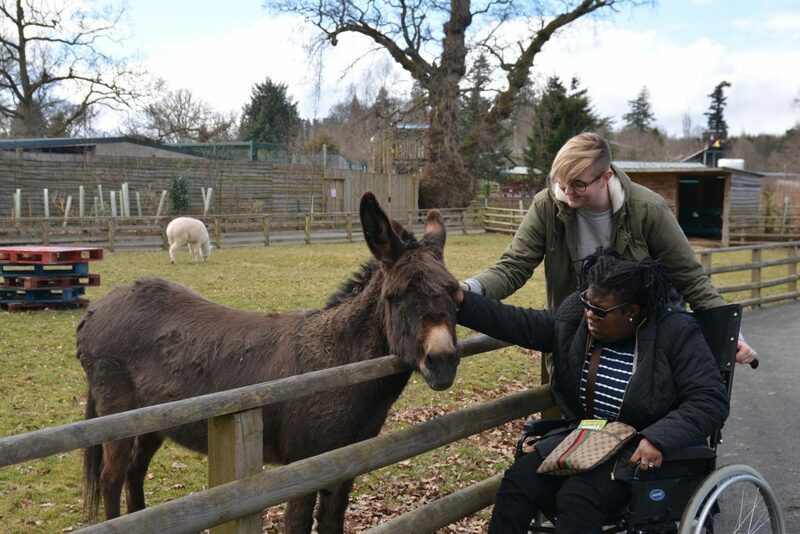 50 young people with additional support needs will take part in evening and weekend activities which they feel engaged with and that they enjoy. We provided a range of fun stimulating and rewarding trips over the 9 months of the project, however, this was to a smaller group of young people than we anticipated. We over estimated the number of people able to take up these opportunities. The young people who attended had a wide range of choices, so they could choose what they were most interested in attending. The feedback we received from the young people and their carers was positive. Carers said that the young people came back excited to talk about the different experiences they had while on the trip. They also said that the young person was looking forward to future trips and would often ask about what we had planned next. G lives with his mum (a single parent who works full-time) and was looked after by his sister (in her early 20s). The family had no support since G left school a couple of years previously. It took a full year of Upward Mobility working with the family and social work to put in place a package that would provide G with a place. During his first session at Upward Mobility G was anxious, nervous and lacking in confidence so much so that he was in tears during his first day. He seemed an unlikely candidate to come on a 3 night glamping break. His mum and sister were desperate for a break but were sceptical that G would be able to cope. G surprised his mum and sister by having a great time. He didn't need to call home, was very happy to sleep in the tent and his social skills (which were lacking before) progressed. His confidence rose considerably. He now has friends at Upward Mobility and is much more confident and independent and continues to attend Upward Mobility as a sessional student. His sister has gone on to start a family off her own. That carers of our students feel less stressed and feel like they have had their batteries re-charged as a result of the respite provided by the project. Carers have reported that they feel less stressed as a result of these activities. Carers are really keen to involve their young people in as many of these activities as they can. It can sometimes take a leap of confidence for carers and students to engage with these activities, but they are very appreciative once they have done. One of the carers we provided respite for is a mother with two young children as well as the young person we provided respite for. She said it was good for her child to have some time out of the house. With work, being a full time carer and having two young children this not only gave her time to recharge but also the opportunity to spend quality time with her other two young children. Carers of our students will engage in activities of their choice (including just relaxing) which they are not regularly able to do as part of their caring role. We freed carers up for a range of two nights (3 days), evenings & weekend days. Carers were happy with the options we gave them and it meant that they could choose the respite which worked best for them and the adult they support. Carers seemed happy, relaxed and excited for their young adult to return from respite after some well deserved time off. Some of the carers we provided respite for said they used this time to relax, go for coffee or to restaurant. Activities that the young person they care for would not wish to attend and if they did attend may lead to challenging behaviour or anxiety caused by being in busy or unknown environments. Others said they used this time to do tasks such as shopping. This gave them a stress free shopping experience and meant the weekend was happier and more enjoyable. Carers will report that they feel supported by the short break opportunities offered and that these breaks meet a need. Carers gave good feedback and expressed that these breaks were often the only form of respite they had ever been offered. Many also expressed that without the funding making subsidised spaces that they could not afford for the young person to attend other services even if they had wished to. When discussing the service one mum said "The family got breathing space. It was important that he knew staff already. I didn't have any concerns. I am confident in the service and would encourage him to go again. There has been a need for this type of service". By giving families respite it means that they can have a break to recharge and their batteries. Long term this means they can provide better care for the young person they look after. It also means relationships are less likely to become strained and people will have healthier and happier times when they are together. That our young people get out and about in the wider community and enjoy weekend day trips in the same way as their peers would. That our young people have opportunities to socialise and enjoy themselves with their friends on a Friday in the same way as their more ‘able’ peers. All our trips were very successful, the young people were excited to get to experience new activities with other young people their age. Many of them felt excited to be able to be independent and to go out with their friends. This was a big change for many of them who explained they often spent their weekends at home. The young people widened their skills in many areas, for some this was a rare occasion to eat out in restaurant and to have the opportunity to spend time away from family in the evenings. Our Friday night Supper Club & Disco were a huge success! The young people were excited to go out with their peers and have fun. One young person said " I feel like I'm going to prom!" excitedly before getting her hair and makeup done for the night. She explained that often she would be at home at the weekend or socialise mainly with family. This gave her an opportunity to eat out in a restaurant, in a main stream setting, she also attended the disco after with all her peers and even met some new friends within the service. To have collected sufficient evidence of the value of what we are offering to carers and the young people to make a strong case to a variety of different audiences as to the value of these breaks. There is no doubt that the breaks and respite offered was valued by both carers and the young people involved. However, we feel that we did not collect as much written evidence of this as we had originally planned to. Instead of detailed evaluations we found that we had much closer contact with families and that it was an ongoing conversation regarding what we were working on. This on going conversation gave us a better understanding of the shorty break needs of young people and their carers. We would like to work from what we learned on this journey to make our future respite even more tailored to everyone's needs and wants. From the ongoing conversations we had between carers, young people and ourselves we learnt what we needed to provide and the role of respite in different peoples lives. Carers discussed how their son thought it "wasn't cool to go out with mum" and this meant he may not participate in weekend events/activities unless he had the support of Upward Mobility. This meant his weekends could be fairly socially isolated from his peers. Many young people discussed that there favourite parts of the trips were spending time with their friends and with the staff they know well. When asked where they would like to go this seemed less important as long as they could socialise and have fun! Many young people attended multiple trips and it was great to see close bonds forming between the groups, particularly for the people who had recently joined the service after leaving school. Carers spoke about how it was important to them that they felt comfortable with their respite provider. They felt that as Upward Mobility provided care throughout the young people's week, this reduced the stress of respite on the young person and also on the carer themselves. One mum while discussing the service said "It's been fantastic. My son is a bit of a home bird but like all young guys he gets bored and fed up. It's good for him to go out with his peers and develop life skills. We knew the staff, so I felt I could ask anything. Also I could phone anytime. I had no concerns. It was a great success. The staff told me how he'd been. ..Ten out of ten".